Super Hero Boy: Our new favorite robot. When I was growing up robot movies were all the rage. Robocop, Short Circuit, Terminator, of course Transformers, my personal favorite the Star Wars robots, and even robot cars (you know Knight Rider). Though Transformers was recently released it seems robots have lost the limelight lately and that's just a shame. You can never have enough robots or robot movies especially cute robot movies that do not shed the whole "robots hate humans" light. Personally I have had nothing but good experiences with robots especially seeing as you can even get a robot that vacuums for you these days what is not to love about them? From the moment I saw a big cardboard display for Wall-e in the movie theater far before the movie was even released I knew I absolutely had to see it and that it was going to be great. Wall-e has to be the cutest most un threatening robot since Jonny X of short circuit, which happens to be one of my favorite robot movies of all time. I mean how could you not love him, a small trash compactor robot that happens to love collecting small trinkets he may just get the award for the cutest robot in a movie yet. The previews for Wall-e were not that revealing, sure you got to see Wall-e and his absolutely adorable voice but past that up to seeing the movie on DVD I really had no idea what the story was and that was an unusual treat as sometimes you end up knowing the whole story before you start. Wall-e is a robot of few words, actually other than the very few humans in the story the robots say very little but there is no lack at all of what is being said. You might not think that a robot can be that expressive but Wall-e and his friend Eve will change your mind about everything you may have thought about robots in the past. Humans have just destroyed earth with trash, so much in fact that they are forced to leave as the trash is taking over everything. They leave earth and leave a whole army of "wall-es" to clean up the mess. I really do not want to ruin the rest of the story for you guys but lets just say its very much a mock of what could potentially happen to us if we do not learn to change our consuming ways.. soon. Wall-e is adorable, he is eco-friendly, the whole story is a good introduction to kids into what could happen if they become lazy consuming bums that so many teenagers I know are. Hopefully we see more movies like Wall-e coming up in the future as I really think its a great movement forward for Disney! I couldn't be more excited about it. We got to see Wall-e in bluray and though I have not seen the standard version I was floored with the bluray presentation. Though Wall-e is most certainly animated the detail you can see on him in the bluray version is ridiculous. From the dirt in his treads to every little knick and dent on him is visible. Not to mention that the blueray special edition offers three full discs of content that's two whole dvds of special features.. two... TWO.. I am still just blown away by that. Games, games and more games... your kids will have a hard time finding what they like more the movie itself or the included dvd games. My favorite part however is the animated shorts and deleted scenes. Actually my five "testers" that watched the movie with me almost loved the shorts as much as the movie itself. There is just something fun about the Disney shorts its almost like having little extra movies. If you are toting a mp3 player that will play movies like many of us are these days or even a laptop you will be thrilled to see that the special edition Wall-es also include a code to get a free digital copy as well so you can easily take Wall-e with you on the road which is great seeing as the holidays will have many of us on the go. 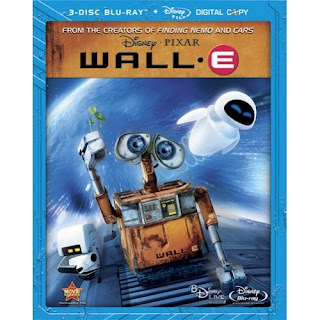 Wall-e is available right now on bluray and in standard format and you can pick up your copy on Amazon! We cant wait to check this movie out! Thanks for the mini review!